These days, I’d like to think I’m pretty good at being frugal. I no longer panic at the thought of a financial emergency, I’m no longer indebted to a bank and I blog here every week about my attempts at frugality. However, there are times that I’ve been too frugal and taken my frugality loving ways a little too far, even for my (second-hand clothes loving) tastes. I’ve never been downright cheap (like not tipping a waitress, even if the service was poor), but sometimes I’ve realized that being too frugal is not paying off like I’d hoped and I’ve ended up spending more than I’ve saved. Apparently you can be too frugal. 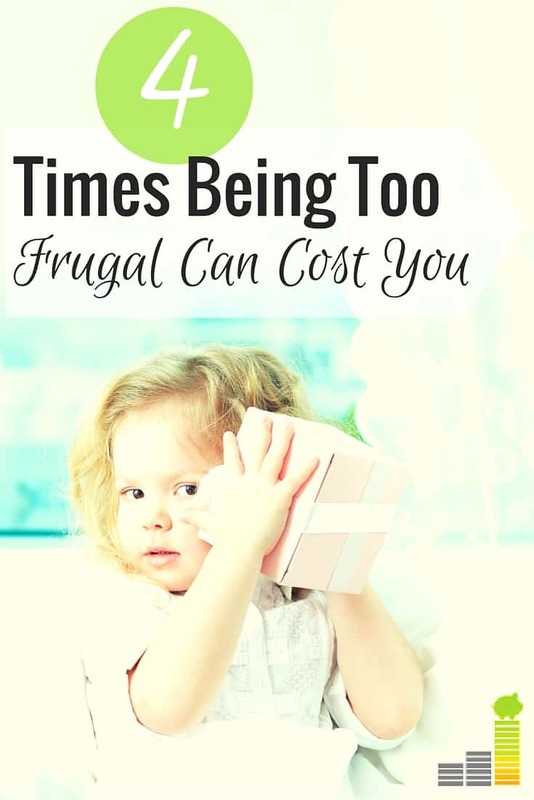 Here are four times being too frugal can cost you in the long run. After I left my job two years ago, I lost some pretty sweet benefits, such as a great health insurance policy for my whole family and a pretty decent dental plan. I’m not going to lie, losing those benefits to become self-employed really stung. Because my husband’s employer doesn’t offer affordable family insurance plans, I’m stuck with a very expensive lackluster health insurance policy and no dental insurance. Although my experience was in avoiding my dentist, the same idea goes for going to the doctor. We all think we’ll be okay, but don’t forgo those annual doctor’s appointments, even if you have lousy insurance like I do, because the upfront cost will be cheaper than the long-term damage you could cause for yourself. I’ve blogged more than once about how to save money at the grocery store, and it’s a pretty common topic in the personal finance world, but I’ve decided it’s not a good area to scrimp on groceries. Quality, unprocessed, organic foods provide more than just daily sustenance. Eating well saves us money from future healthcare bills and encourages us to make other smart choices in our lives, such as exercising more, drinking less alcohol and quitting smoking. Live “too frugal” when it comes to your food and you could be hurting yourself and your family in the long run. When we make healthier choices with our food, we are bound to make healthier choices in other aspects of our lives, too. There’s a reason I got off the Groupon mailing list a few years ago. It made me obsessed with feeling like I was getting a good deal, and instead of saving money like I thought I was doing, I spent more money because of it. If you’re lured into your favorite store by a sale sign or are obsessed with finding a “good deal,” you’re absolutely going to spend more money in the long run. Stockpiling goods from big box stores in amounts that you’ll never be able to use up in a timely manner is not only wasteful but expensive. Unless your last name is Duggar, you can probably forgo that Costco membership completely. Unfortunately, there are times when being too frugal can do more harm than good. 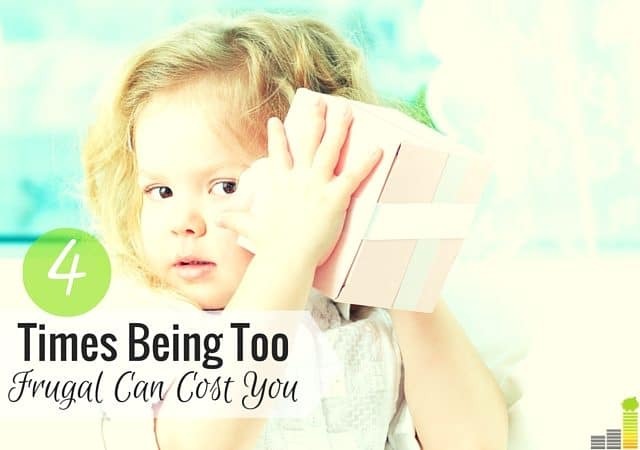 If you get obsessed with trying to be too frugal in every aspect of your budget, you might end up sacrificing something bigger along the way, like your health or your retirement planning or college savings. Instead, determine the aspects of your budget that are worth spending more money on, and reap the benefits of frugality by saving on the less important areas in your budget. If you aren’t sure how to evaluate your budget or want help tracking your expenses and identifying opportunities for shifting around your spending, an online tool like Personal Capital can help you get there faster and easier. Do you have an area of your budget that you like to spend more money on? What is worth a splurge to you? Have you ever had an incident of a #FrugalFail? I’ve done the same thing. What a waste of money! Ignoring warning signs can often be costly, and this can apply to many different things. For example, a couple of years ago, we saw that our dishwasher was slowly going out. It was starting to develop small leaks (which we stopgap repaired for awhile, but knew it was just that) and was becoming less effective. So, we started looking at what we wanted and looking for sales, and were able to score a fantastic deal. If we’d just waited until it fully gave up (which was soon, anyway), we probably would have paid more because the sales wouldn’t have been as good. I know a few people guilty of #4. It’s like, what are you going to do with all that barbecue sauce anyway? I buy some items we use frequently in bulk, but I no longer stockpile too much. I try to pick up stuff when it’s on sale instead. I’m embarrassed to say I had an entire corner of a room dedicated to unopened diaper boxes. I mean, what was I thinking?? I’m guilty of #4, especially when it comes to ketchup, toilet paper and laundry detergent. I have a large pantry and a huge basement so it doesn’t take up space needed for other stuff, and I only stock up when it is truly on sale. However, because I only live about 5 minutes from the grocery store I’ve slowed down on getting this stuff. Perhaps in the winter I might stock up on a few things, but not to the extent my stash looks like a mini-mart. When we downsized our house (and subsequently our storage space), I quit stockpiling a lot of stuff simply due to lack of space for it. Honestly, I haven’t noticed much of a difference in savings because now I just buy what I need and my “stockpiling” only results in buying a couple of extra cans of green beans when they’re on sale instead of a whole case. Great points. #1 and #2 are especially important I think be because you are investing in your best asset (your health!) by paying more for those services. I am definitely guilty of the stock piling! Your health is definitely worth spending more money on. Let me tell you, first hand, a root canal is a lot more expensive than just going to the dentist on a regular basis! Also, long term, investing in your health now will definitely make retirement a lot cheaper for you! #1 is a great point!! And a root canal is way more painful than a couple of cleanings twice a year! Bear in mind that in going to the dentist you have to be lucky that they are not the kind who deliberately damage your teeth. Take photos of your teeth while they are undamaged and make sure YOU keep those records so you don’t depend on dental offices or dentists themselves. Dental offices throw out visual records/Xrays after a certain amount of time and you need those records in case a dentist damages them or you have an accident affecting your teeth ( a fall, or a car crash etc) and need those teeth restored by someone competent. I’ve had 2 dentists commit malpractice on my teeth and several others who are simply incompetent and did not fix my teeth properly. It is very stressful and will end up costing me tens of thousands of dollars to fix, plus getting me in debt to my family until I can overcome my current health problems and earn money. So take these protective measures and if the worst happens you’ll be in a better position to fix them. Another area I’ve heard people talk about being too frugal is “investing in yourself. That could be continuing education or investing in a small business, coaching of some type, or maybe getting counseling or therapy if needed (I guess that’d be similar to #1). Great list–I think these are common frugal fails! That’s a good point. I put myself in therapy after my father passed away, and it was some of the best money I’ve ever spent. I have no shame about it nor do I regret what I spent at the time. Why would you feel shame about being in therapy? With number one, I think people especially avoid the doctor when they have a high-deductible plan. So many people advocate for high-deductible plans because of the HSA, but the initial out-of-pocket cost of care may deter people from making necessary appointments. That’s why I don’t shop at BJs/Costco…what’s the point of shopping in bulk if you’re not gonna use it. And for #1, I don’t think it’s frugal to avoid the doctor or dentist…it’s being CHEAP! Don’t be pennywise and pound foolish. I’ve been to Costco exactly once and I have no plans of ever returning. Not only do I not save money there, but I also find it incredibly depressing for some reason. This list is right on! I am completely guilty of #1. While our regular dentist visits are covered, we have a high-deductible health insurance plan, meaning everything up to around $7500 is out of pocket. And while we have an HSA for that purpose, I can actually invest my HSA money, which I cannot stand the thought of touching. It’s a problem I need to get past, for sure. Thanks, Amanda! I’m completely guilty of #1 as well. I need to buy more healthy food. I purchase some fruit and veggies but nowhere near enough. I’m usually finished with them in a week or two. I need to buy more so that they will stretch longer. I’ve gotten so much better in the last few months about feeding my family more produce, and it’s easier now that everything is in season and cheaper. Good post. Just like we take ourselves to the doctor or dentist, we also need to pay attention to the things in our lives that need maintenance, such as cars. Preventative maintenance is usually less expensive than whatever you’re trying to prevent in the first place. I’m TERRIBLE with preventative maintenance, and I rely completely on my husband for that with our cars and appliances. Terrible, I know! #1 is such an important one. On the one hand, YES – the cost of medical care has done nothing but gone up. But if you don’t deal with issues now they are likely to cost more down the road. I didn’t deal with my allergy issues in college and I ended up having two sinus surgeries after college (and starting allergy shots at the same time). If I had just been more proactive I just maybe would have avoided both surgeries. We (well, mainly I) used to stop at BJs every weekend to stockpile on everything. After awhile it was just getting to be too much in our closets and pantries. Now, we mainly stop for the veggies that do get consumed within the week. This is so true, I guess it’s taking it a bit too far that is the problem. I’ve really taken #2 to heart. Buying the cheap processed stuff is almost always unhealthy and doesnt even leave you full. Lots of value in buying fresh quality products. You’ll probably save more in the long run anyway because you’ll reduce your chance of chronic disease. I’m really splurging on lots of fresh veggies and fruits right now since everything is in season. It’s worth the extra money when my family eats well. I admit I am guilty of no. 1. Haha! I try as much as possible to self-medicate or use over-the-counter products. But, I’ve learned my lesson not to be too frugal. I’m guilty of it, too! I definitely agree! I make sure my doctor and dentist see me regularly because without fail, if I don’t I always pay for it, literally. Also, stockpiling, it became too much work for me anyhow and I thought it was better to free up my time to earn more on the side than stockpiling things that I might not even have use for. Frugality at it’s best is when you save money in a way that aligns with your values and financial goals. Otherwise, it’s just a waste of effort. I couldn’t agree more with your last two sentences. Well said! I can relate to this. I have expired cans of cream of chicken soup because I stocked up too much when they were on sale. Something similar happened with ketchup, so now I remind myself there will be another sale soon and there’s no need to go nuts because I really hate WASTING money even more than spending it. I think a lot of people fall into the “cheap” dogma instead of following true frugality. Frugality isn’t about scoring the best deals, couponing, or stockpiling. It’s about making conscious, healthy choices that benefit your wallet and the world. Frugal people have a longterm outlook; cheap people do not. So true. A lot of people don’t recognize the differences between being frugal and being cheap.